Sefer Orhot Hayim. Extensive index on the Shulhan Arukh Orah Hayim and Yoreh De’ah of Joseph b. Abraham de Monteles. ספר/ אורחות/ חיים/ שולחן טהור בלי סיג. Sefer Orhot Hayim, extensive index on the Shulhan Arukh Orah Hayim and Yoreh Deah of Joseph b. Abraham de Monteles, copied by Isaac b. Hayim Israel Saruco, Amsterdam, ab. 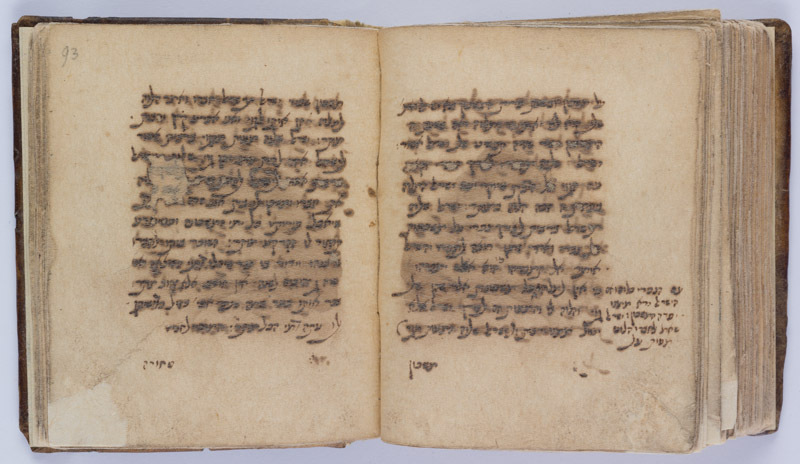 1690.
f. 1v-77v: Text on Orah Hayim. f. 78r: title II: ספר יורה דעה/ והוא קיצור הלכות/ יורה דעה. f. 79r-109r: Text on Yoreh Deah. Hebrew / Paper / 9,9 x 7,8 cm. /  ff. (partly with original foliation) / Sephardic cursive writing (2 last ff. in different later Sephardic cursive hand) / 2 title pp. written in square characters / Catchwords at the bottom of each page.